paper size: 46 x 60 1/2 in. frame size: 55 1/2 x 70 x 2 1/8 in. 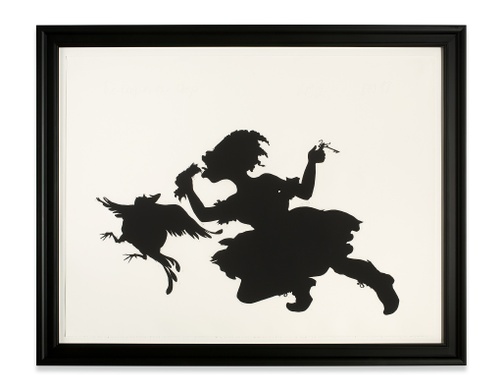 Kara Walker examines race, gender, violence, and class through her silhouetted figures of the antebellum South. 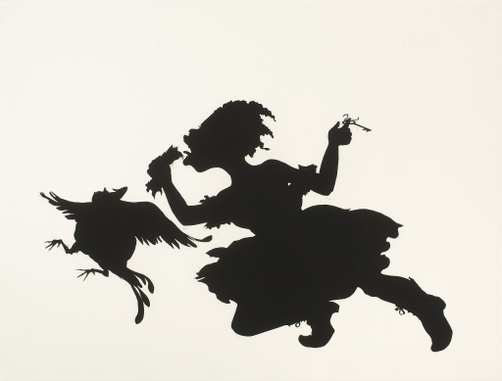 By using the 18th-century bourgeois silhouette portraiture technique to create caricatures of racial stereotypes, Walker addresses “blackness” as a construct. Traditionally made by women, silhouette portraiture was deemed a craft, a sentimental keepsake or souvenir. It was also tied to the pseudo-science of physiognomy that linked one’s profile to intelligence. With such histories tied to her technique, Walker questions what it means for groups of people to define themselves through images, stereotypes, and memory.